All S-100 systems have some kind of "Boot ROM" to bring up the system on power on. This can be a simple ROM based monitor that shows a series of menu options or one that directly loads a floppy or hard disk operating system. Most systems have a ROM that does both. Many of the systems have the ROM on the CPU card itself. There are advantages of this:- "Power on jump" circuitry to the ROM is easier, and in some case the ROM can later be shadowed out when the operating system loads. The disadvantage is the ROM takes up space on the CPU board. The early Cromemco, SD Systems, TDL CPU boards did not have the ROM onboard. When we come to 16 bit systems the situation is the same. However in this case two ROMS were typically used for a 16 bit interface. Also in the case of the 16 bit CPU's which started in high memory the circuitry was somewhat more involved. Again some manufactures had the ROM onboard others did not. Because the 16 bit CPU cards I will and have used can be a tight fit on the S100 boards when you add co-processors etc. I wanted to have a separate 16 bit EPROM board. Further I thought it would be nice to have it such that it could accommodate both 8 and 16 bit CPU's. Now today there are many types of PROM's is a whole range of sizes. I designed the board to accommodate most of the common types. That's the good news. The bad news is that in order to do this there are a larger than normal number of jumpers on the board. You really have to careful go through each ROM type and match the pin numbers with the appropriate input. There are a many other chips that can also be used by adjusting the jumpers. I just have not tested them out yet. Please excuse some of the wire connections. They will be corrected on the final board. Note: All EEPROMS (electrical erasable, rather than UV light) of the equivalent capacity above will have the much the same pinouts/jumpers. However in a few cases where there are differences. For example with 27C256 EPROM's and 28C256 EEPROM's. So always check the pinouts. I made this mistake recently with 28C256 EEPROMS only to have them re-programmed in a 27C256 socket setup! Note you do not have to use the full 128K of Flash RAM. By adjusting (see below) the RAM/ROM window that activates 16CS* using SW2 and IC2A you can select sections of the chip and surround the rest with other S-100 RAM on the bus. 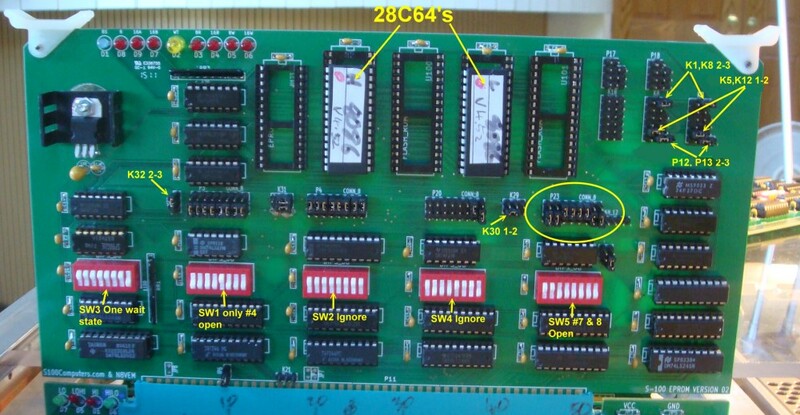 The other RAM board however must recognize the S-100 Phantom line (pin 76). The 4MG Static RAM board is an example of this. These two chips will allow the board to have 128KX16 or 512KX16 (or 256KX8 and 1MGX8) of fast static RAM memory on board. 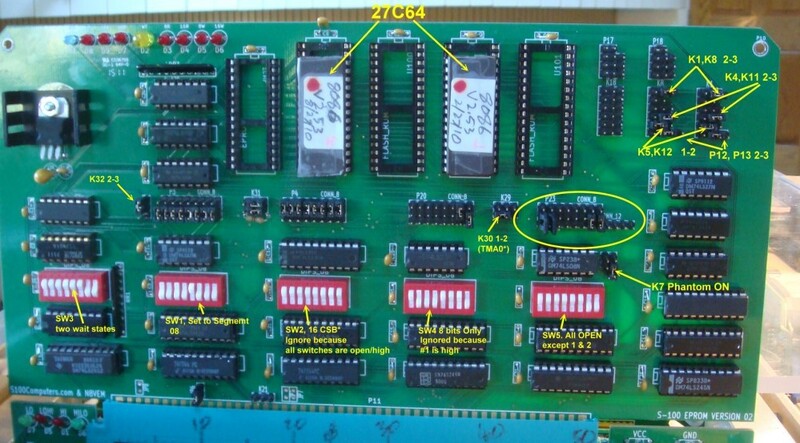 Very useful is the fact that at the same time the board can have an 8 bit EPROM (or EEPROM) for a Z80 board. 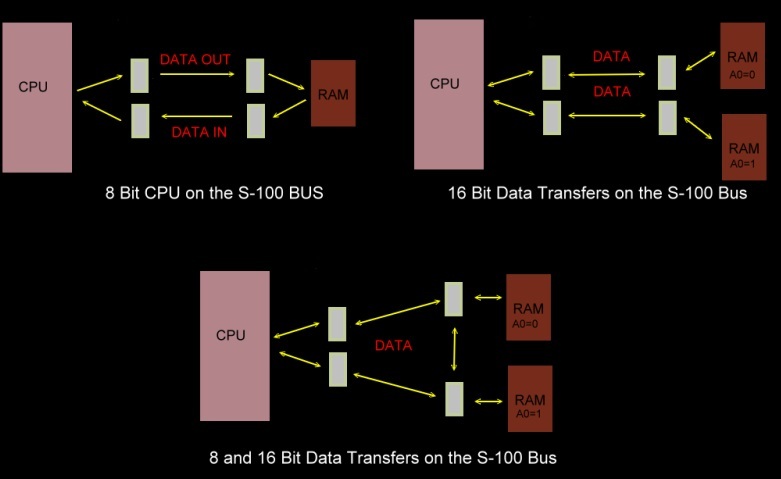 This is a repeat of the discussion on the 4MG RAM Board -- The S-100 bus was designed around the 8080 CPU. This CPU has a bi-directional 8 bit data path, however because Ed Roberts wanted to control it via a series of front panel switches, the CPU data bus was broken out into separate 8 bit Data In and Data Out paths on the S-100 bus. This worked fine. RAM boards had their RAM chips connected to both data paths and I/O boards were likewise connected. It was a somewhat inefficient setup but it worked (all for a simpler front panel). The first diagram below shows the basic layout. The hardware logic to do this is quite tricky. You need to factor in if we have a CPU read or write, if the data is 8 bits or 16 bits wide and if the destination address is on an even or odd address line. (Fortunately no common 16 bit CPU transfers 16 bit data an odd address line). I wanted to build a S-100 PROM board that would serve me well into the future. Where I could use it with very fast and wide CPU's. I wanted to stick with DIP type chips. There are higher density PROM chips than the 512K/chips we use here but many require SMT. These are difficult to work with. I have had good success with the 32 Pin DIP Alliance AS6C4008 (512KX8 Static RAM) chips, (Jameco Part #1927617) with the 4MG Static RAM Board. I wanted to be able to use this chip again here. The board utilizes 74LS682's for RAM addressing. If you are unfamiliar with this technique click here. The hardest part was figuring out a PAL equivalent circuit using standard TTL chips. I came up with the following "7400" TTL layout. It takes a few chips as opposed to a single PAL chip, but it is fast and reliable. This PROM board is really three boards in one. It's an 8 bit EPROM board for an EPROM that resides in < 64K of the S-100 bus address space and two 8 or 16 bit EPROM/RAM boards for any address from 0 to 16MG. The former is for use with 8080/Z80 CPU's. Very useful is the fact that both sections can reside together and overlap on the board. A typical application might be CPM3 and/or CPM with a memory disk. Note however, these applications require a CPU board that can address above 64K (Intersystem's, Compupro etc). 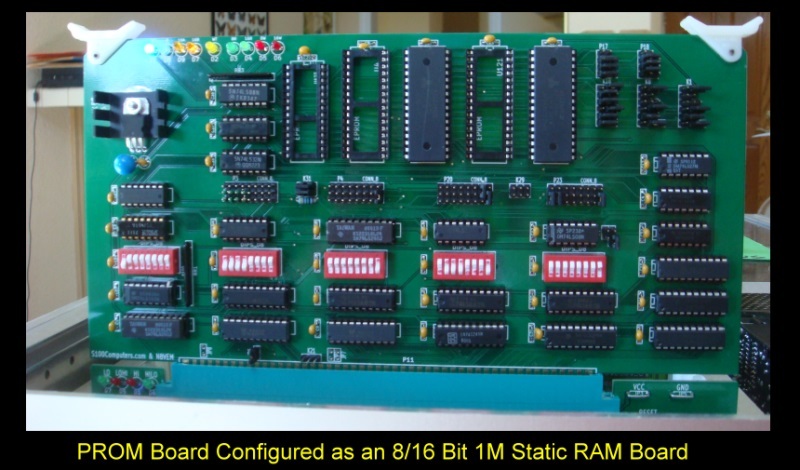 The board can accommodate up to 1MG of 8 bit RAM. Remember also, that to program EPROMs for 16 bit CPU's you have to program the "Low Byte" in one EPROM and the "High Byte" separately in the other EPROM pair. The board has three independent buffers to place data on the S-100 bus. These are controlled separately by three signals 16CSA*, 16CSB* and 8CS*. The circuit is arranged so both the board data output buffers/EPROMS cannot come on together. Finally you will notice for the CAT28F010 FLASH RAM's (Jameco Part #242608), the CE* is tied to ground (rather than 16CSB*). The reason for this is that these Flash RAM's go into a "Low Power Mode" when CE* is high. There is a latency time required for the chip to "warm up" after CE is brought low. Keeping it low avoids the problem. The chips are low power anyway! This unfortunately does mean that FLASH RAM chips cannot be used at the same time as EPROM's in the U4 & U121 sockets. The boot Z80 monitor EPROM/EEPROM would reside at F000H in RAM. 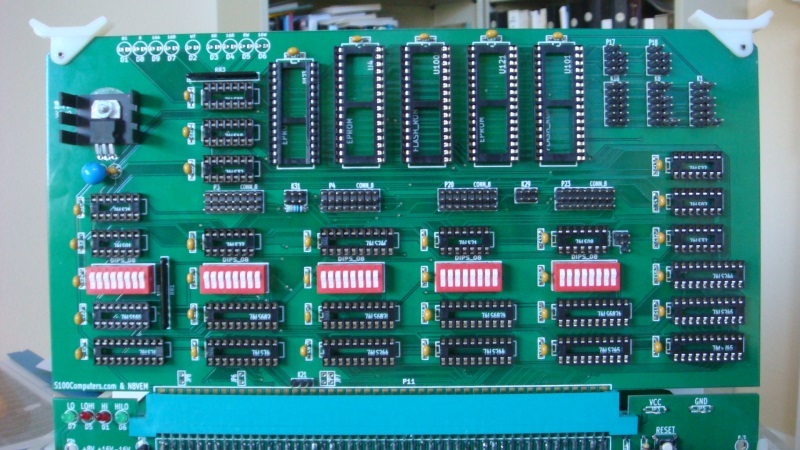 With a Z80 CPU board like the Intersystem's board, the rest of memory could be used for CPM3 banks and/or as a memory disk. This is what I do in my system. If a 8086 CPU has control of the bus then it will first start from the reset address FFFF0H in RAM. Here it would find the end of the 8086 Monitor (in a pair of 28C64 EEPROMS). From there it would jump to the start of that monitor (at FC000H). Amongst the commands would be one to boot CPM86. Again this is the way my system is setup and I will describe all this later when we do a 8086 S-100 CPU board. There are two things to keep in mind with the above arrangement. First, the static RAM 512X8 pair occupy the entire 1MG address space. 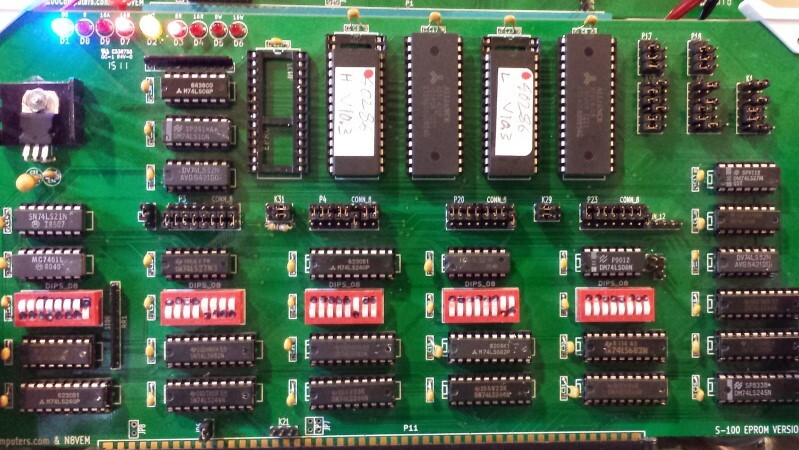 The circuitry on the board insures that these RAM chips are not activated if any of the above 3 EPROMS are addressed. See below. For the 8 bit EPROM at F000H-FFFFH, if it is addressed, the line 8CS* will go low. This inactivates any output from the PAL like circuit. Instead it activates its own S-100 bus buffer (U125). For the 16 bit EPROMs at FC000H-FFFFFH, they are addressed by 16CSA* going low. This same line is inverted (U14B) and used to inhibit 16CSB* (U124D) which normally activates the static RAM chip pair (U100,U101). One final thing, we normally don't want the Z80 EPROM to be active when the 8086 CPU is controlling the bus. The 8086 gets control of the bus when the S-100 signal TMA0 signal goes low. 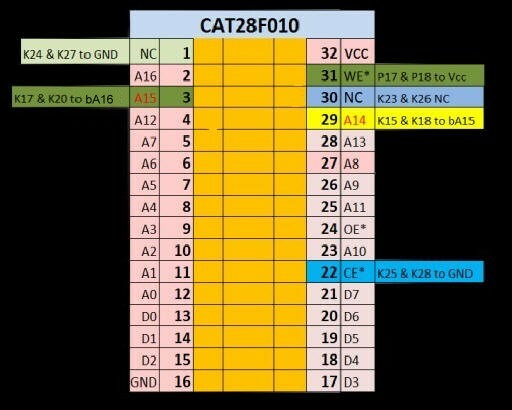 Again look at the schematic, by jumpering K29 1-2 and connecting P19, pin 7 to P21 pin 7 and opening SW4,7 we can insure that this EPROM is never active when the 8086 has control of the bus. Much of this may sound confusing right now. It will become clearer when we do 16 bit CPU boards next year. The above board had worked without any problems in two systems using CPM+ and CPM86 with a verity of hardware configurations so I decided to go ahead and do a final commercial type board. The trace layout was optimized further before doing this. You can see that it includes some changes form the above prototype board. It is now really three boards in one. The 8 bit EPROM socket has its own self contained circuitry and addressing capability. 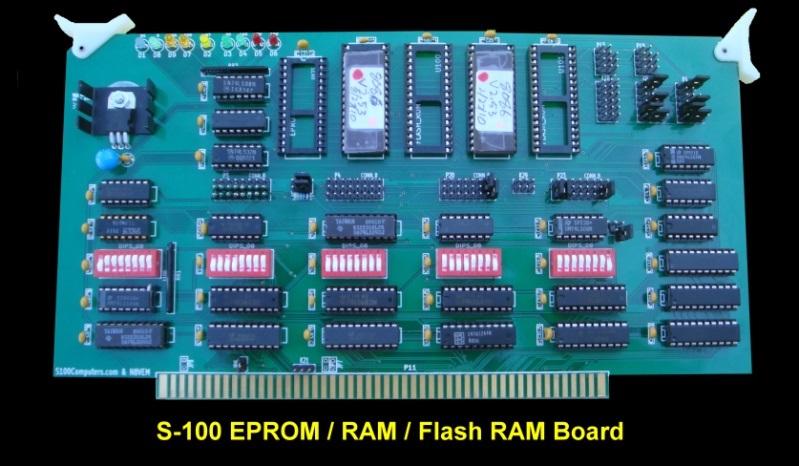 The 16 bit EPROM/EEPROM section is also separated from the RAM/Flash RAM circuit. This board can accommodate almost any type of common EPROM or EEPROM, quite a few static RAM chips and also Flash RAM chips. That's the good news, the bad news is that there are quite a few jumpers and switch settings you need to setup to configure the board for your setup. In building this board, sure you could install everything set up all jumpers at once and plug it into your system and in theory have it come up the first time. If you take this approach -- also buy a lottery ticket. Better to step the build in a series of steps. Checking functionality as you go along. Here is a guide to doing this. First install all non-IC components on the board -- including the 5V (1.5A) voltage regulator. On the latter, I have inserted a mica washer between the heat sink and the board because one of the traces on the front side runs a little close to the heat sink. Probably overkill, but check this out. Insert the board into your system and check your system boots up fine. First we will install the 8 bit EPROM circuitry. We start by adding in the chip select addressing circuit. Layout the board circuit in front of you. This will make things clearer as you go along. Install U3, U20, U21, U8, U11, U14 and IC3A. Next we have to decide where we will place our EPROM in the Z80's 64K address space. We do not want your RAM board and this EPROM board putting data on the bus at the same address. If your current systems RAM board accepts the phantom line (S-100 pin 67) things are simple. 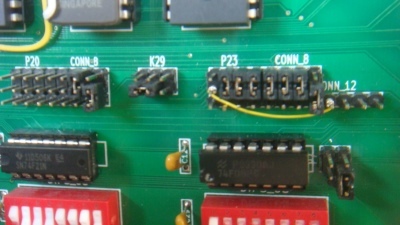 The phantom signal from this board (K7 pin1) will in-activate your RAM board when EPROM on this board is addressed. If your RAM board does not recognize the phantom signal (most do), you need to select a < 64K RAM board and place the active adders range of this board outside that space. For example a 32K RAM board and place the EPROM at 8000H for this board. 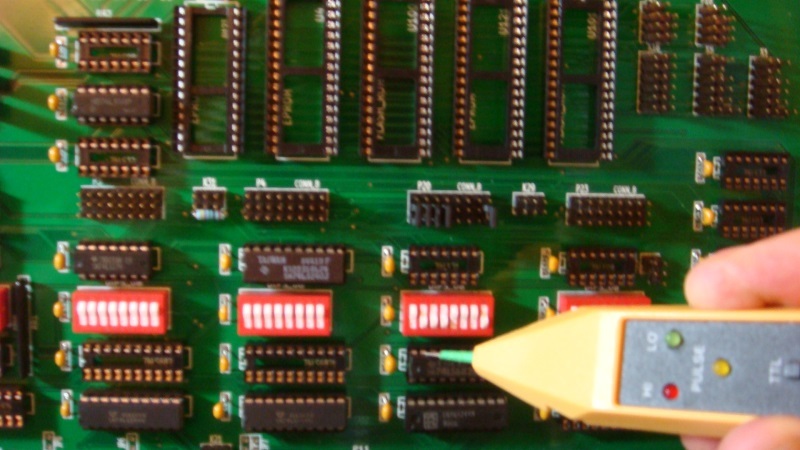 The Z80 will continuously read memory at 8000H in the EEPROM. Please see here to understand how 74LS682 addressing is done. For addresses in the range 8000H to 8FFFH, A15 will always be high and A14, A13, and A12 will always be low. So we jumper P19 and P21 as follows:- 1-1, 2-2, 3-3, 4-4. Since we are using 4K we ignore A11 so tie p21,5 to P20. We also ignore the phantom INPUT, so also P21,6 to P20 (and P21,7 to P20), but do accept the low going pulse from U14 pin 12 when S-100 addresses are < 64K (so P19 pin 8 to P21 pin 8). On SW4 then 1-8 are:- open,closed,closed,closed, closed,closed,closed, closed. Setup the board as described above and check with a logic probe for a low going pulse on IC3A pin 19. Next add U124 and U1. Check as above for a low going pulse on pin 3 of U124. You can then install LED's D1 and D8. They should light up with the above continuous software loop. Next install U2 (but bend out pin 4 for now). Jumper K7, 1-2. 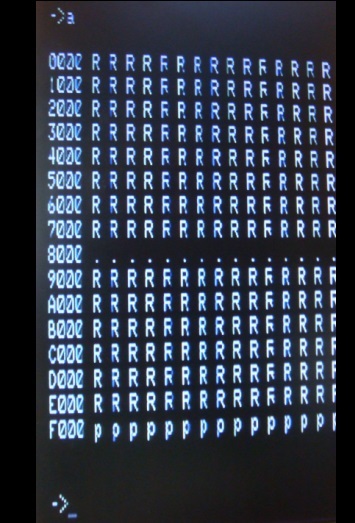 If you have a Z80 monitor that displays a memory map you should see no RAM are 8000H to 8FFFH. Next install U10 and U125. Check pins 1 & 19 of U125 pulse low with the above software loop. We will now install a 2732 EPROM. Consult the pinout diagram above for this EPROM. Jumper K22, 2-3 and K31, 2-3. You now should be able to display the code in the EPROM and if necessary jump to it. Any time you want to inactivate this circuit (i.e.. make the EPROM invisible on the board) close switch 7 of SW4. 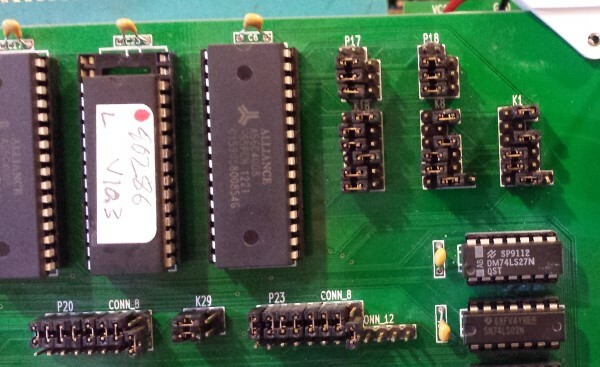 New we will install the more complex 16 bit circuitry and/or > 64 K addressing for EPROMS and RAM. 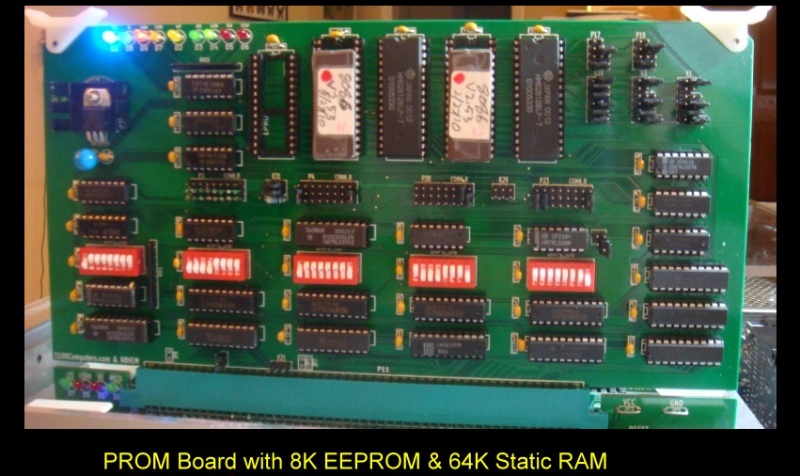 Initially we will use 28C64A EEPROMS as an example. This is where things get a little bit more complicated. You will need some way of addressing >64K in the S-100 Bus. If you have a 8086 CPU board in your system already this is no problem. Alternatively you can use a Z80 board that can address > 64K like the one I use and describe here (and hopefully soon will be available). I will be doing 16 bit CPUs next year, so you may wish to wait until then for this feature. In our initial setup we will place the 28C64 EEPROM at 8C000H in RAM. This will avoid its interfering with a 8086 Monitor normally at FC000H in RAM . On reset the 8086 will jump to this monitor. Install IC1, IC4A and U14. Since we are addressing RAM at 8C000H, address lines A23-A20 are low, A19 is high, A18-A16 are low on P1 as inputs to IC1. Match SW1 accordingly. For P22, A15 and A14 are high, A13-A11 are ignored, pin 8 of P22 will be low. Match SW5 accordingly. Display memory at 8C000H (either with your 8086 monitor or with a Z80 that can memory map). Exactly as above, pin 6 of U124 should pulse low. Next install all IC on the board EXCEPT the EEPROMS, U22, U23 and U24. You can also bend in pin 4 of U2. Insert the board into your systems and check it does not hang. Next install U22,U23, and U24. Repeat the above check. We are now ready to install the 28C64 EEPROMS. Carefully consult the pinout requirements of the chip. See the above diagrams on this page. Remember the data sheet pinout numbers are different from the board socket numbers on this board (unless you are using 32 pin chips). Odd Byte EEPROM:- K1 2-3, K4 2-3, K5 1-2 P12 2-3. 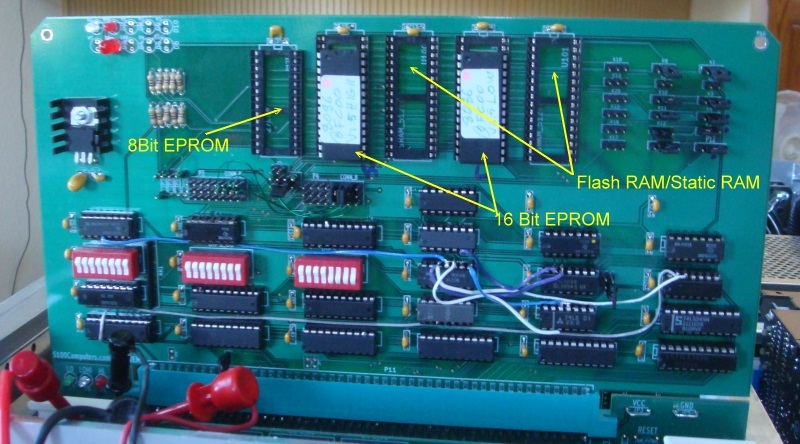 Even Byte EEPROM:- K8 2-3, K11 2-3, K12 1-2, P13 2-3. Up to 8 wait states can be added to any CPU read/write cycle with this board. Switch SW3 controls the number of wait states. If all switches are open, no wait states are added. SW3-1 closed, adds one wait state, SW3-2 closed adds 2 wait states... etc. For a 8MHz 8086 I typically use two wait states for most ROMS. You can probably get away with one but why risk it. Remember switches are close right to left. (One wait state is the right most switch, eight wait states, all 8 switches are closed). Do not use other switch patterns. Note there is one small error in the layout of this board. LED D2 is used to indicate wait states. Unfortunately it is on in the absence of wait states going off if a wait state is added. It really should be the other way around. This is easily corrected by bending out pin 9 of U17 and on the back of the board jumpering pin 9 of U17 to pin 7 of U17. Now lets add some static RAM to the board. Again there are a number of available RAM chips and many permutations and combinations as to how things can be configured. There are two basic ways RAM can be added to this board. One is along side the EEPROM/ROMs. SW1 sets the starting and ending location of the RAM block and within this block the EEPROM/ROM resides. The relative location of the ROM's within the total RAM space is set by SW5. Not all of the space defined by SW1 need be used by RAM. The switch SW2 allows one to block out or include sections. Alternatively the board can be configured as an (up to) 1MG Static RAM board. 16 bit ROM's are not utilized, however the 8 bit ROM capability remains. A typical application here might be CPM+ and a memory disk with a Z80 Monitor/Boot BIOS at F000H. 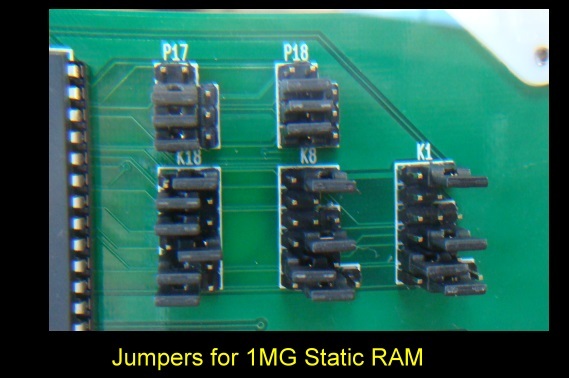 You can even splice in a 16 bit EEPROM/ROM pair in this 1MG static RAM by jumpering connections between P1 and P24. However this is really not optimum because the onboard RAM is slowed down to the access speed of the EEPROM/ROM. A better approach is to utilize our dedicated 4MG Static RAM Board and this board as a dedicated EEPROM/ROM board. As an RAM example, lets pick 128K X 8 chips (HM628128LP-7). We will place these chips along side the EEPROMS and put them in sockets U100 and U101. Lets start the RAM at F0000H. It will therefore reside at F0000H to FFFFFH. We will puncture this RAM space with an EEPROM at FC000H to FFFFFH. Note: These RAM chips are way overkill for this example since we are only using 64K of the total 128K X 2 bytes available. The extra RAM is simply ignored by the board circuitry in this example. The above picture shows the board setup. Odd Byte RAM:- K17 1-2, K25 1-2, K15 2-3, K23 2-3, Even Byte RAM:- K20 1-2, K28 1-2, K18 2,3 K19 1-2, K26 2-3. Again we need to carefully configure the appropriate jumpers for the RAM pins. Odd Byte RAM:- K17 1-2, K25 1-2, K15 2-3, K23 1-2, K24 1-2. 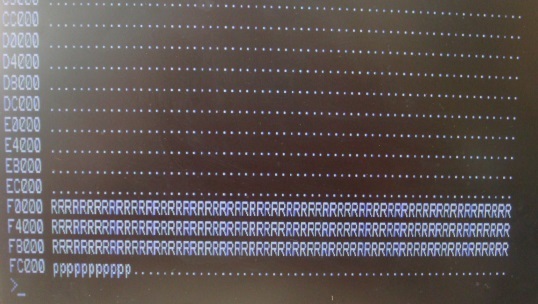 Even Byte RAM:- K20 1-2, K28 1-2, K18 2,3 K19 1-2, K26 1-2 K27 1-2. Since we will be using the first 1MG of the S-100's 16MG address space the only jumpers on P1 to P5 are A23, A22, A21 and A20. The rest are removed. On SW1 switches 1, 2, 3 & 4 are closed/ground and 5, 6, 7 and 8 are open. The only jumper on P2 to P5 is 8-8 and the only closed switch on SW2 is number 8. Finally to inactivate the 16CSA* circuit, remove jumper P22 to P24 8-8 and close SW5 switch 8. 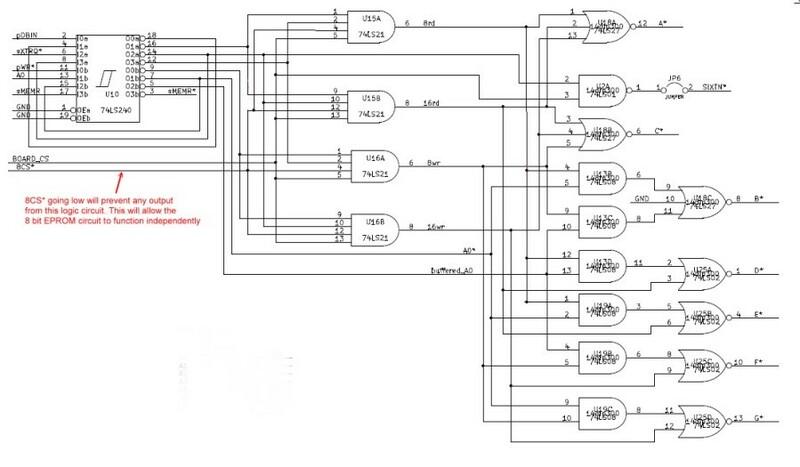 I know this may all sound confusing but if you look at the schematic and understand how 74LS682 address selection works it becomes quite easy. I will leave it as an exercise for the reader to figure out how to splice in an 8K EEPROM at the top of this memory space -- for example an 8086 Monitor at FC000H. (Hint, use wire wrap jumpers from connector P1 to P24). Finally the board can be configured to accommodate Flash RAM chips. These behave essentially the same way as the above RAM chips. The only difference as I said above is that the board cannot accommodate a 16 Bit Flash RAM and a 16 bit EEPROM at the same time. (8 bit EPROMS are fine). BTW, it may be possible to actually program Flash RAM's on this board. I have not looked into this. I have always programmed my Flash RAMs separately on a Wellon VP-280 programmer using PC software. Version 02 of This Board. 1 Connect BOARD_WAIT to pin 7 of U17 (instead of pin 9). (this eliminates wait states if RAM is used). (Jumper B below). This allows an EPROM at FC000H if 1MG static RAM is present at 0000H. For the V1 board, we needed wires from P1 to p24. I come back to using this board from time to time, when I am debugging multiprocessor systems. While the board will accept almost any type of PROM, I have to admit configuring it for the appropriate ROM is quite a challenge. You really have to carefully study the PROM pinouts and sit down an carefully configure the boards address decoding. Remember it is three boards in one. However most of the time you will be concerned with EPROMS and the SW5/16CSA* section. The other two sections can be ignored/inactivated. As time goes by I will show pictures of exact configurations I use to help you get started. Please note the number of wait states will vary depending on your S-100 bus (and whether you have the card in an S-100 bus extender board slot). Start with a high number and work down. Example 1: Two 27C64 (UV Erasable) E-PROMS (16 bit mode) at address 8C000H to 8FFFFH. Example 2: Two 28C64 (Electric Erasable) EE-PROMS (16 bit mode) at address 8C000H to 8FFFFH. Example 3: Two 28C256 (Electric Erasable) EE-PROMS (16 bit mode) at address 88000H to 8FFFFH. (i.e. 80000H to 8FFFFH) you would jumper P23-1 to P24-1 and close SW5 #8.
and two 512X8 AS6C4008 Static RAMs at address 00000H to EFFFFH. 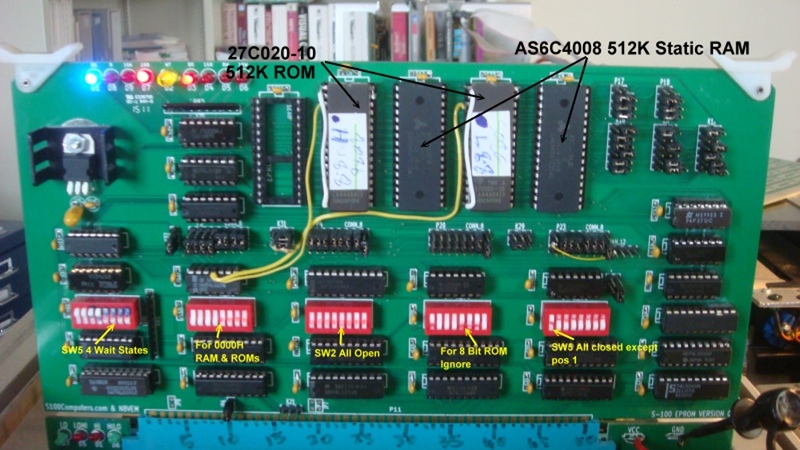 This is a typical configuration of the board for an S100 system that has its own Z80 onboard ROM, (for example the Z80 board shown here), and uses this single board for S100 RAM to run either CPM3 (utilizing > 64K) or an 8086 family of CPUs utilizing 1M of RAM and a ROM monitor at FF000H to FFFFFH. The fact that the 16CSB* section for the board's RAM does not have it's own A16-A23 74LS682 select is not great. While not a problem for an 8086, it would mean this boards RAM would appear in every 1MG of the S100 busses 16M address space when using for example our 68K board. However in that case you would not use this boards ROM/16CSA* selection. The next version of the board will completely separate 16CSA* and 16CSB*. The above configuration utilizes the fact that for addresses in the range F0000-FFFFFH the EEPROMs are selected (16CSA* low). The signal 16CSB* will ignore "LOWER SELECT". Only Phantom is recognized by IC2A. It is also important to make sure 8CS* is not active. Jumper P20,8 to P21,8 and SW4,8 open insures IC3A pin 19 never goes low. and two 128X8 HM628128 Static RAMs at address 00000H to EFFFH. The above configuration would be typically used by a Z80 board that can jump to 0F000H upon reset (e.g. 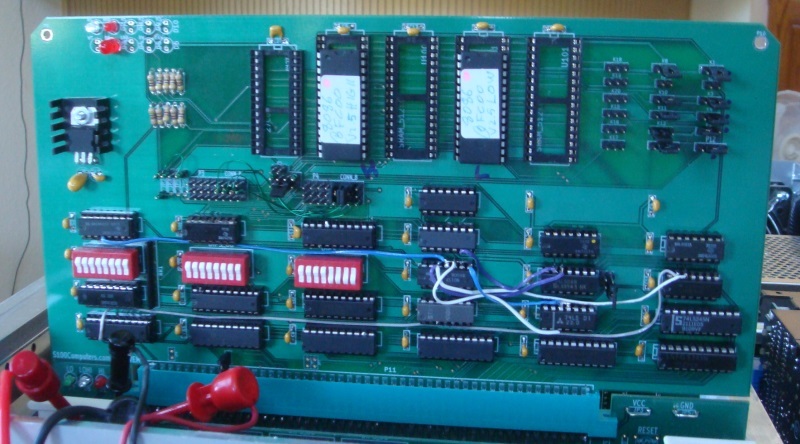 The Cromemco ZPU board or CompuPro Z80 boards. The remainder of RAM is filled (actually over filled), with RAM. Note how 16CSA* and 16CSB* have the same settings. and two 512X8 AS6C4008 Static RAMs at address 00000H to 7FFFFH. The above configuration is a bit unusual in that half of the S-100 buses lowest 1MG address space is occupied by ROM (80000H up to FFFFFH). This is useful for 8 bit systems where the disk operating system for example could be stored in ROM. Unfortunately there are a few small errors on this board that affect these high capacity EPROMS. Pin 1 needs to be connected to ground (pin 16). Pin 3 of the EPROMS must go to address line A16 not A15. This is picked off at pin 11 of U11. 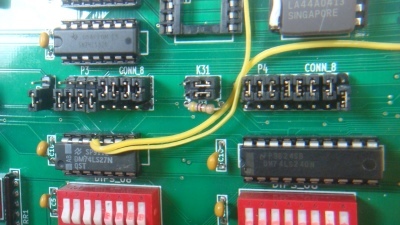 Pin 31 needs to be connected to Vcc (pin 32). While we could use the same ROM/RAM selection logic as in Example 4 above, this time I used a more generalized approach. IC1A triggers for any address in the buses first 1 MG space. Its pin 19 is feed to IC4A and IC2A. IC2A will trigger for any address in the 1MG range but its output is inhibited by IC4A (U124 pin 12) if the addresses bA16-bA19 on P22 are greater that 7FFFFH. Please note, I have found these EE-PROMS (ATMEL AT28C64's, Jameco #276752 , or AT28C256's , Jameco #74843) to be particularly sensitive to read access times. They seem to require at least one wait state, even at 6MHz . To run the board with our 8086 board set to 9MHz, the following 74LSx chips need to be changed to 74Fxx types:- U15, U18, U13, U19, U25. You need to add 1-2 wait states and it's best if the board is in a slot next to the 8086 CPU board in the bus. U22, U23 and U24 must be 74LS245's. Always check you system, by copying the EPROM memory to another place in RAM and verifying the move, (the 8086 Monitor "M" and "V" commands). If you want long term high speed reliability, I recommend the UV erasable 27XXX EPROMS. BTW, the 8086 board itself requires only one wait state at 9MHz if EE-PROM's are used locally on the CPU board itself; however this is really pushing it. Normally I have two EEPROM wait states for reliability. Lastly because this board has the ability to accommodate 8 bit EPROMS, 16 bit EPROMS and 16 bit static RAMS the circuitry is a bit more complex than for any one of these features alone. 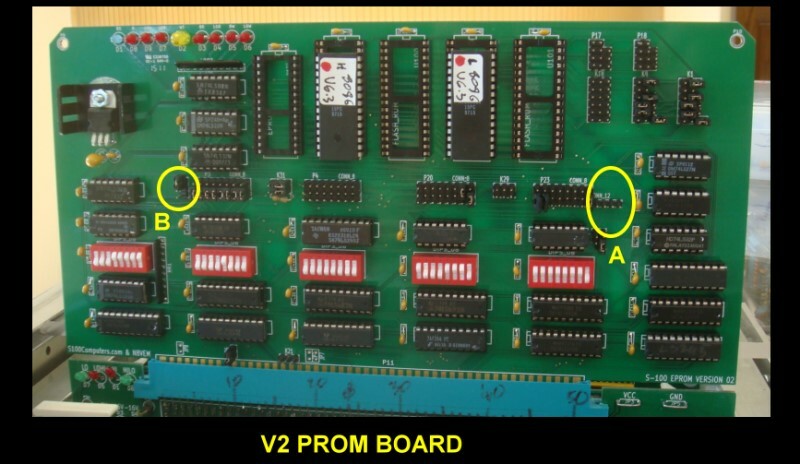 If you just need a pair of 16 bit EE-PROMS, (say for an MSDOS video driver), I would suggest you go with the MSDOS Support board which has 2 EE-PROM/EPROM sockets. This board's circuitry is set for the fastest possible bus access times. Recently Tom Lafleur has caught an error on the board (thanks Tom), Pin 1 of U4 and U121 should be connected to address line bA19 instead of bA18. If you have not assembled the board yet, you should cut the trace and join as appropriate. On finished boards it may be easiest to just bend out pin 1 (if used, see below), and wire a connection to it. Fortunately few chips use pin 1 in these sockets. It should not affect any other 27XXX, 28Cxxx UV or EE-PROM chips. 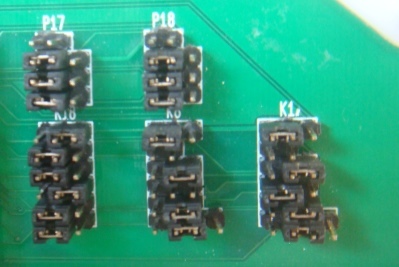 Only the bottom 24 or 28 pins are used in the sockets for these chips). Even the HM62128 (128X8) Static RAMS are OK. Only (1MX8) static RAM chips (e.g. AS6C4008) should be affected. The FLASH RAM sockets (U100 & U101) do not have this error, and in fact you can use these two sockets for the AS6C4008 static RAMs if you are only using static RAM chips with no FRASH RAM onboard. Please note, this board is now largely replaced by the RAM+ROM board. See here. Note, the schematics below may change over time and some IC part or pin numbers may not correlate exactly with the text in the article above. 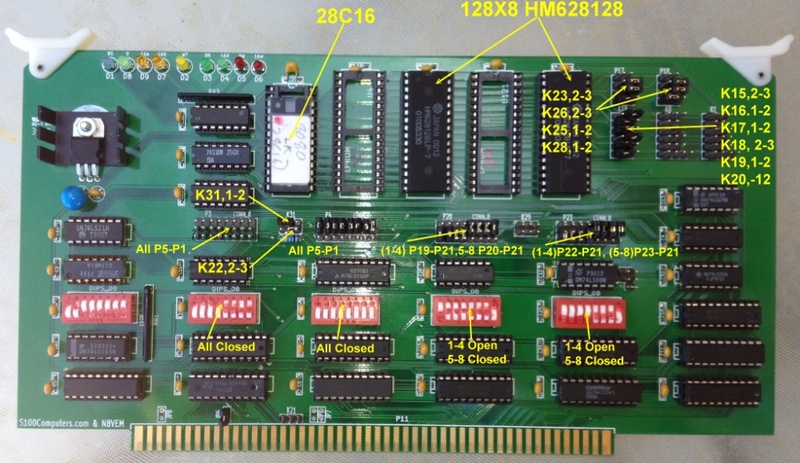 There were two “production versions” or this board released. The first has "ID 3510" on it at the top left hand corner. The later second board has “Version 02” in the bottom right corner of the board. 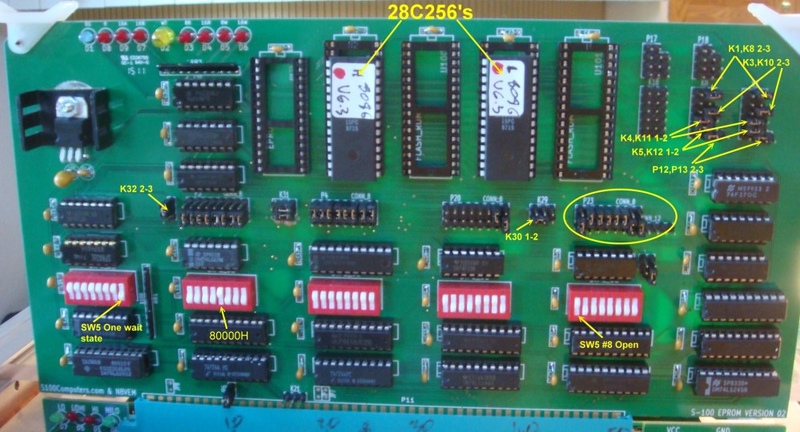 What is confusing in the schematics is they are referred to as V2 and V3, because we originally had a V1 board ready for “production” but halted it because of errors on the board. The main difference between the two board versions can be seen on P22 where extra address lines were added for V2.